Anne Dube-Magoso in Chimanimani, March 22, 2019, was lucky to escape alive, but with several injuries, when her family's house collapsed during the cyclone March 16. But her 83-year-old father was suffocated. 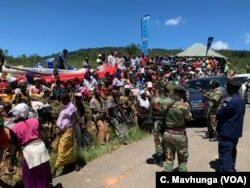 People in Chimanimani complain, March 22, 2019, to senior army officials in charge of a temporary camp set up after Cyclone Idai that food is not reaching them.